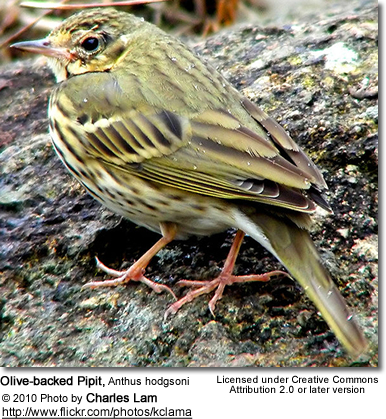 The Olive-backed Pipit, Anthus hodgsoni, is a small passerine bird of the pipit (Anthus) genus, which breeds across South, north Central and East Asia, as well as in the northeast of European Russia. It is a long-distance migrant moving in winter to southern Asia and Indonesia. Sometimes it is also called Indian, or Hodgson's, Tree Pipit, owing to the resemblance with the Tree Pipit. 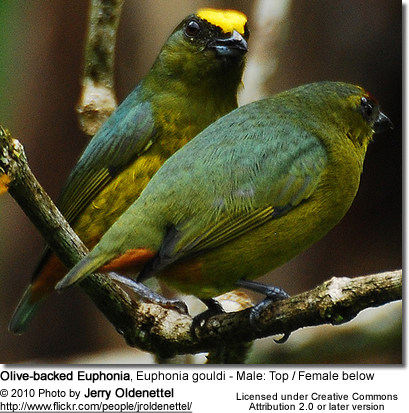 However, its back is more olive-toned and less streaked than that species, and its head pattern is different with a better-marked supercilium (line above eye). Summer: from Himalayan India, westward through Nepal, into China, north to Gansu province, and eastwards through Korea to Japan, and north through north Central Asia into north-eastern Europe (European Russia). Occasionally a rare vagrant in western Europe. Breeds up to 4500m in eastern Nepal. Appearance: Greenish brown streaked with darker brown above. Supercilium (line above eye), double wingbar and outer rectrices (= the long flight feathers of the tail) are whitish. Whitish to buff below streaked with dark brown on breast and flanks. Sexes alike. Food: Mostly insects, but will also take grass and weed seeds. Eggs: 3-5, usually 4. The color is dark brown, spotted darker. Usually two broods are raised.